POMONA, CALIF. (September 7, 2011) – The 2011 Lucas Oil Off-Road Expo powered by General Tire will invade the Pomona Fairplex Saturday, October 8 through Sunday, October 9, with everything off-road including new vehicles, thousands of parts and accessories, ATV test rides, freestyle motocross action, movie premieres, RC Racing and more. 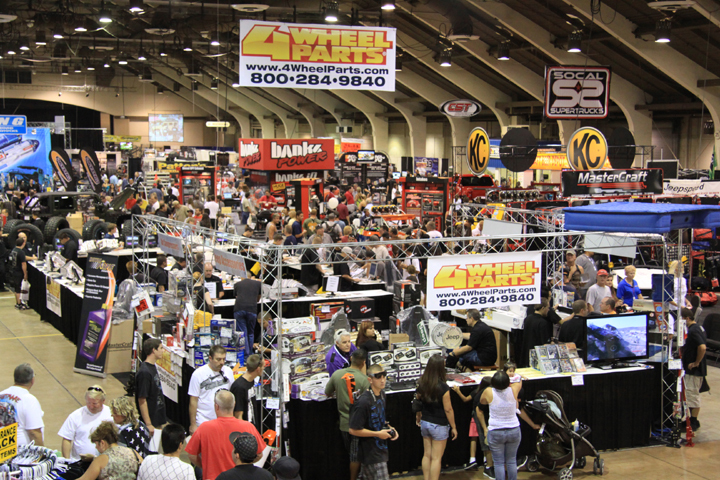 This year’s expo is bigger than ever with more exhibitors showcasing all the latest off-road toys, technologies, parts, gear and accessories from more than 350 of the industry’s leading manufacturers, dealers and distributors. Lucas Oil Off-Road Racing Exhibition Course – Title sponsor Lucas Oil revs up this year’s expo with the high-powered, high-jumping race trucks from the Pro 4 Unlimited and Pro 2 Unlimited classes performing on closed-circuit courses simultaneously. Professional drivers will demonstrate the capabilities of these amazing 800-plus horsepower V8-powered machines. Yamaha ATV & UTV Test Rides – This year’s expo is home to free Yamaha ATV and UTV test rides all weekend on the demo course. This closed-circuit obstacle course will test the endurance and agility of these all-terrain vehicles and give drivers a real-world off-road experience. Whether you are an avid ATV/UTV enthusiast or just getting into the sport, experts will be on hand to provide all the necessary equipment and instruction needed to experience riding in a fun environment. Freestyle Motocross Action – Freestyle motocross legends will provide gravity-defying aerial action in special performances throughout the weekend. NEW! Overland Adventure Travel Pavilion – For the first time, a special expo area will be dedicated to everything adventure travel related – products, equipment, accessories, travel planning companies and more. Professional Freestyle Motocross Riders and Off-Road Racers will be on hand signing autographs and greeting fans including Lucas Oil Driver of the Year Brian Deegan signing autographs in the Maxxis display, King of Hammers champion and rock racing/rock crawling star Shannon Campbell and many more. Losi Professional RC Racing – Professional drivers will take scale models of real life vehicles through all the turns on a specially built RC racing dirt track. Be there as Losi unveils a brand new product you won’t want to miss! Movie Premieres In Dirt Theatre – for the first year, a screening area dubbed “Dirt Theatre” will showcase some of the best independent off-road films from talented off-road filmmakers. Attendees will witness insane off-road racing action from trophy trucks, to rally cars, to bikes — everything on dirt. Founded by Martelli Brothers and produced by Mad Media, the 2011 General Tire Mint 400 (extended version) and Dezert People 9 are among the movies that will get your heart pumping. Movies will play throughout the weekend allowing attendees to sit, relax and enjoy the action. Lucas Oil MAV TV Live – Lucas Oil MAV TV will broadcast live at the expo from a MAV TV studio located on the main stage all weekend. Lucas Oil Off-Road Racing’s premiere commentators will interview drivers, celebrities and industry leaders, and present the latest, must-have off-road products. Big screens positioned throughout the expo will showcase all the action and offer valuable prize giveaways each hour. Miss Lucas Oil Off-Road Expo Bikini Contest – On the main stage, beautiful bikini-clad women will compete for the cash prize, tiara and “Miss Lucas Oil Off-Road Expo” title. 2011 Team Challenge – Hosted by BlueRibbon Coalition, this unusual, one-of-a-kind challenge to find the best prepared trail rig is making its first stop ever at the expo. Set to take place on Sunday, October 9, at 11 a.m., teams will be challenged with locating and racing key items to judges to demonstrate readiness for any situation on the trail. Teams will have a chance to win prizes while raising funds to help support land use and keep trails open. The Lucas Oil Off-Road Expo has named BlueRibbon Coalition as the official charity for the 2011 event. BlueRibbon Coalition is a national non-profit organization dedicated to protecting responsible recreational access to public lands and waters. Whether you recreate on a mountain bike, snowmobile, motorcycle, personal watercraft, ATV, four-wheel drive, horse, or your hiking boots, the coalition is committed to keeping land open for recreational use. The 2011 Lucas Oil Off-Road Expo powered by General Tire will take place Saturday, October 8, from 9 a.m. to 6 p.m. and Sunday, October 9, from 9 a.m. to 5 p.m. Held at the Pomona Fairplex, located at 1101 W. McKinley Avenue in Pomona, Calif. Tickets purchased on-site will be $12 for adults, $5 for children (6-12) and free for children under six. A Family Four Pack is available for $20 and includes admission for two adults, and two children (available online only). For more information and to purchase advance tickets, visit www.offroadexpo.com. Follow Off-Road Expo at www.facebook.com/OffRoadExpo and at www.twitter.com/OffRoadExpo.